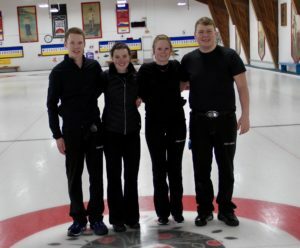 The Junior Slam Series is delighted to announce the winners of the Connor Ramsay Memorial Bursary presented by Team Glenn Howard. Firstly we want to thank all the applicants for your submissions. It was truly inspirational to read the personal essays and references from your peers. The Bursary Committee had a very tough decision to choose among the quality applicants, all of whom exemplified the qualities that Connor brought to the sport. We are thrilled to announce our winners. Congratulations to Madison Fisher from Parry Sound ON, a student at McMaster University and Eric Fenech from Toronto ON, a student at Ryerson University as our inaugural winners. We are planning a formal presentation with the winners, team Glenn Howard and Connor’s mom, Wendy in the coming weeks. Watch for further details. Once again thank you to all those who applied for the bursary. We wish each of you the best in your continued pursuit of curling and academics.